The Web is buzzing about some sketchy details of a pre- pre- pre-production synth from a new company called Sonoric Instruments. There are some preliminary sound samples and lovely product renders: hey, if nothing else, these guys can make some attractive imaginary case designs. The synth looks like an analog / FM / wavetable hardware instrument with simplified control scheme (modules with knobs and a joystick navigate an LCD menu system), and like many new synths, the hardware will act like a plug-in in your software. Tom at Music thing has some thoughtful analysis of what this could be and what it means, including pointing out James Grahame’s observations on the potential of cheap, programmable analog synth chips. I’m not sure if Sonoric is describing real analog synthesis via digitally-programmable but truly analog circuitry or just virtual analog synthesis like everyone else offers. But could this happen? Sure, because every product starts as a mockup in someone’s head. Then again, starting up hardware companies is a lot tougher than starting up software companies, and we’ve seen a lot of indie hardware fail. If we see anything substantial, you’ll be the first to know. In the meantime, I think we could all get into this product rendering game. Well, okay, maybe not me — my 3D modeling skills leave something to be desired. 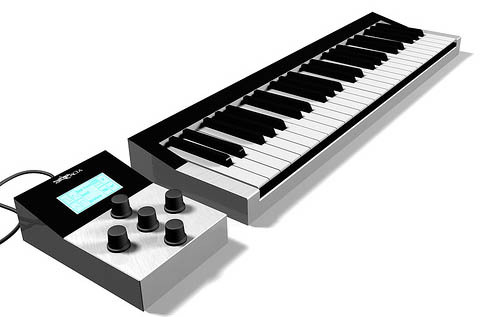 Fake mock-up of a new Moog synth, anyone?